Showcasing a sunny bright yellow interior, this Tatty Devine Banana mug is meticulously crafted from quality porcelain and has a capacity of 350ml. Presented in a stylish, jet-black branded gift box, the Banana mug makes an ideal gift and will add a quirky statement to any home. Tatty Devine have been creating contemporary, punchy jewellery for almost twenty years but have recently teamed up with MAKE International to produce the first ever Tatty Devine ceramics range. The banana motif has been around since 2011 and it’s a little nod towards Andy Warhol’s iconic Velvet Underground album cover. With skin curved back mimicking the perfect peel, the banana design is displayed in a sunny yellow to match the yellow interior and contrast with the white ceramic background and statement black handle. 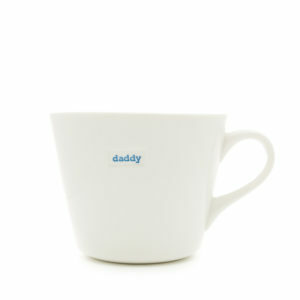 The Tatty Devine Banana mug boasts a spot of splendour with its gold lustre branded stamp. Stylishly eccentric, the Banana mug is bright enough as a single mug but unstoppable amongst it’s coordinating Tatty Devine mug cousins. Unfortunately, our Tatty Devine mugs are not microwave safe so please no microwaves. There’s metal in the gold lustre and we know metal and microwaves don’t mix.